This is the original Red vs Blue episode, marking a new way of interacting with computer games. The Backyard story is one of people, place and communication. It began in the mid to late 90s when Local Radio staff started dabbling with emerging technology. At that time it was a cottage industry and most of the dabblers learnt web production in their own time and in their own way. In 1990 while working as Manager Regional Stations for the Northern Territory, the Central Australian branch of the Australian institute of Management presented me with their inaugural “Manager of the Year” award. Sometimes it appears that mobile phones have been with us always, yet in 1988 the arrival of a cellular phone network in Darwin was big news. 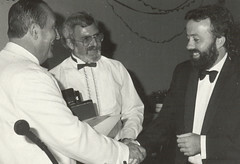 Receiving the award from the Administrator Commodore Eric Johnstone, and President of the NT Branch of the Australian Journalists Association, Richard Creswick. In 1987, primarily through a body of work surrounding the world heritage listing of Kakadu National Park, I was the joint winner of the Electronic Journalist of the Year award for the Northern Territory. I shared “The Eric” with my colleague Phil Smith, who had a reputation for the quirky stand-up.